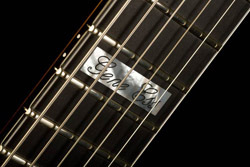 2006 CP Thornton Elite "Gene Ess"
A semi-acoustic electric guitar made to my specifications. It is a great sounding guitar and is very comfortable and light. It currently has a Benedetto B6 in the neck pickup and Fralin humbucker in the bridge pickup. My main guitar since late 2006. Thornton is a great luthier and I am very happy with this one. "Elite Made for Jazz Guitarist Gene Ess with 5A Maple Top and Back, Dark Honey Burst, Diamond Inlay, Name Inlay at 12th Fret, 6100 Fretwire, 1 3/4" Nut, Jazz Wiring, Gold Hardware, Black Tuner Buttons, and Ebony Tailpiece"
This guitar has a carved spruce top and maple body. Yamaha does not make guitars like this anymore and this guitar has aged very nicely. Has a great tone that only aged guitars seem to possess. I use Seymour Duncan Alnico Pro II pickups in this guitar. 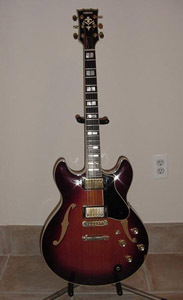 A great 335 type of guitar but kind of like an upgrade to the stock Gibson 335s. Very well made with quality woods. The pots, frets, and the tuning machines have been replaced over the years. Pretty much all stock except the Les Paul Lite. It has Duncan pickups (humbuckers) and Roland GK2 synth pickup. I love the Les Paul Custom for just about everything. The L5 is a one trick pony but does the jazz thing very well. Little too bulky for comfort. Les Paul Lite is a great versatile guitar for more electronic music. 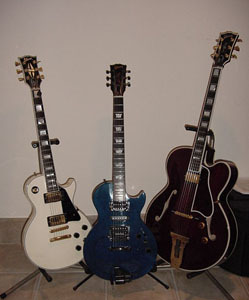 The above are some of my guitars. I also play 1962 Fender Strat, 1980 Kohno Concert guitar, Roland G707 Guitar and GR300 synth. I have been working with electronics since I remember. When I first moved to New York, I worked in the digital technology field. Not much of a surprise as many musicians are also very math and logic oriented. And when it comes to troubleshooting, the creativity and intuition along with knowledge and logic is a must. 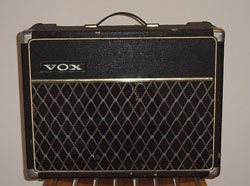 I do all my amp repairs currently and mods as well. I've restored vintage amps to its original specs and I really love it. 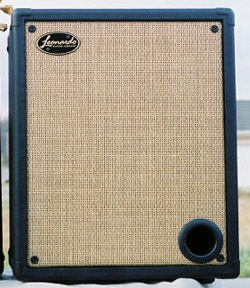 There is something about old tube amps that is just really cool. I love the sounds of them and have a bunch. I have taken on some of my friend's amps to help them get it singing/roaring again. If you have ever tried to get your precious amps repaired here in NYC, you know what I am talking about. Long waits, shoddy work, and expensive. Feel free to contact me if you want your amp worked on or just to talk amps. I am very busy being a full time musician so I can only accept amps on a limited basis at this time. But if I do take on the work, it will be done very, very well. Just ask anyone that knows me. Or come to any of my gigs. My favorite amp. It has a tone to die for. Cathode bias with no negative feedback circuit and 2 EL84 power tubes. I restored the inside to its original specs and it sounds great. I only record with it and do not take it to gigs. The rat's nest inside the Vox. Here you can see some caps I replaced. You can see some resistors that need to be changed as well. 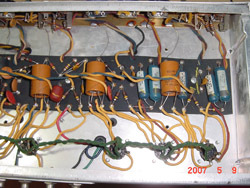 Everything in the amp was original including the electrolytic caps which had to go after 42 years! 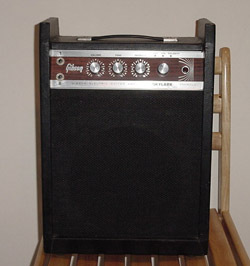 Kind of an under rated amp from the Fender blackface era. I prefer this to the Twin Reverb or the Vibrolux. It has two 12inch speakers and is quite loud. Great for gigs if it wasn't so darn heavy. I did a complete overhaul on it and it is sounding great. Check out the photo below. 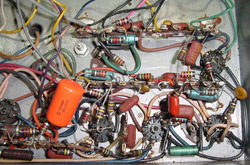 All original components from 1966. I had to replace the original cathode bypass caps since they were leaking. 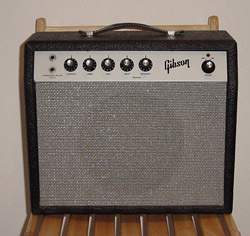 This amp has the classic Fender tone and I biased it a little hot to give it a great juicy sound. These amps are wonderful. I love to hook them up in stereo and play all day. Perfect for home practice and recording. 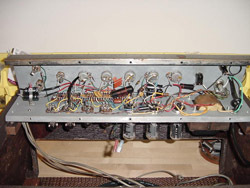 The 1967 is a true class A amp with one EL84 tube. The 1966 has a pair in push-pull. Similar to Fender Champs from the 60's but I prefer the Gibsons. Really funky tremolo on these guys and looks really cool. The sound breaks up great when pushed. I am in the middle of over hauling this guy. These amps originally sounded very bright and did not have much volume. Not the best design by Gibson but can be made to sound great by changing a few things. 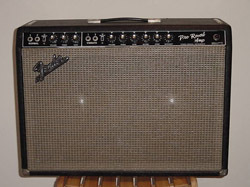 The tweed Falcon from 1961 is a killer amp. I think I will restore this to the original specs though. I have plenty of dark sounding amps. I currently use Acoustic Image Clarus 2R amp and Raezer's Edge 12 speakers for my live performances. What? Heresy you say! I love tube amps but being a jazz musician, I refuse to carry anything heavy. The AI amp is like 6 pounds or so and certainly sounds good enough. Also, I can't easily replace vintage amps if anything happens to them on gigs. I play LaBella Black Nylon 12's, Lexicon LXP1, Maxon OD-808, Yamaha UD-Stomp, Canare GS-6 and Mogami 2524 cables with Switchcraft or Neutrik plugs, and Dunlop Jazz II picks.